Rooms from $102.00 per night. Description This Stockbridge, Georgia hotel has an indoor pool, free internet access, non-smoking guest rooms and an on-site restaurant. With a gorgeous indoor pool a fitness room and freebies like Wi-Fi the non-smoking Holiday Inn Hotel & Suites Stockbridge/Atlanta I-75 is a sensible choice for our guests. With a dramatic central atrium the five-story Holiday Inn Hotel has an bright airy atmosphere. The 112 non-smoking rooms have such up-to-the-minute amenities as flat-panel TVs with instant-access movies CD players and free Wi-Fi access. The extra-thick mattresses are triple-sheeted for that pampered feeling. Microwaves and refrigerators are great for snacks and coffeemakers give you the boost you need in the morning. There's a pretty indoor pool (heated so that you can enjoy it throughout the year) and a fitness room with cardio and strength-training machines. The on-site restaurant serves breakfast and dinner and room service is available. Parking is free. Off I-75 and less than a mile from I-675 the Holiday Inn is a straight shot from Atlanta. Downtown destinations like the World of Coca-Cola are about 20 miles north. Closer to home the Stockbridge Village Shopping Center is a half-mile from the hotel making this location a boon for bargain shoppers. Hartsfield-Jackson Atlanta International Airport is 15 miles northwest. 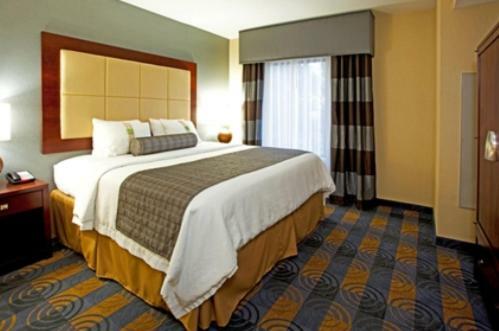 Add Holiday Inn Hotel & Suites Stockbridge/atlanta I-75 to your free online travel itinerary.